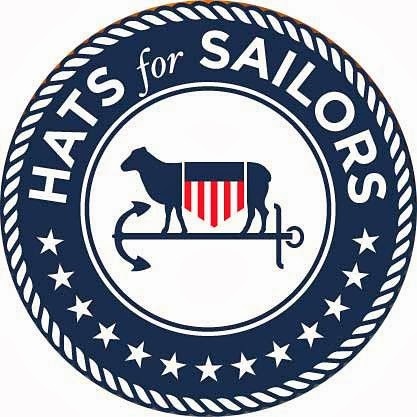 In anticipation of Season 4 of "Downton Abbey," I've been watching seasons 1-3 on DVD.Since I've seen all the episodes multiple times, this allows for lots of knitting time! I started this sweater ages ago and had all the parts knitted and blocked for about two years. When I spent the weekend at Mary's cabin, I started sewing it together. Because it has a hem on the bottom and the sleeves that has to be turned up and stitched down, a button band and and a neckband -- it too longer to do the finishing than to knit the sweaters. And the buttons have gone missing. But the Shetland wool in Sunglo coral is lovely! I've knit three cowls and have another started. 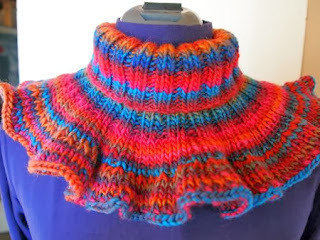 This one is "Downtown," a variation of the Downton Cowl by Shannon Cook. It's knit with the Madelinetosh DK "Cousteau" that Elder Son gave me for my birthday last year. I made mine longer than the pattern because I like to wrap my cowls twice and still have them not be too tight around the neck. This is Stephen West's "Purl Ridge Scarf" knit with Cascade 220 Paint. It's not quite the raspberry color it shows in this photo, but it is a gorgeous purple variegated. This is another cowl knit with Madelinetosk DK, this time the colorway is "Filigree." 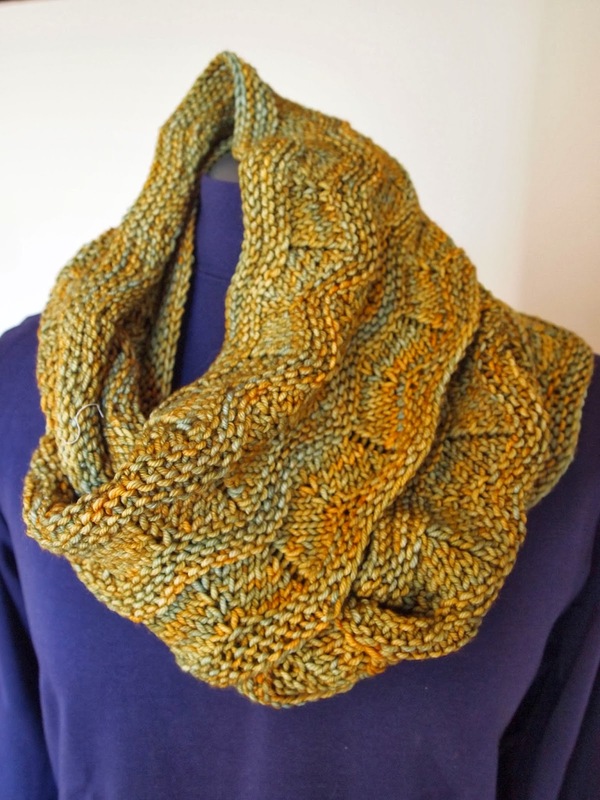 It is a variation on "Waves of Grain" from the new Scarf Style 2 book by Ann Budd. 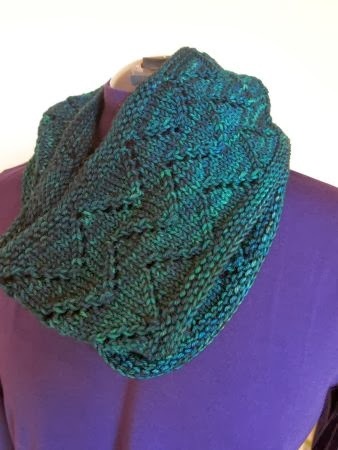 I had two skeins of Mini Mochi worsted and made this neckwarmer -- of course, I tossed the pattern as soon as I finished it and can't remember the name of the pattern! 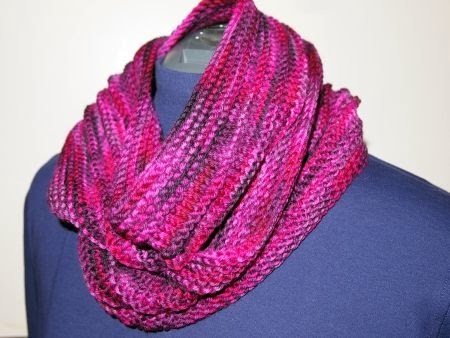 But if you belong to Ravelry, there are lots of similar neckwarmers there! 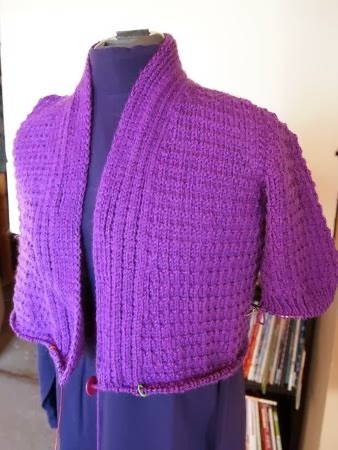 I also started a purple sweater for my "Japan Wardrobe." 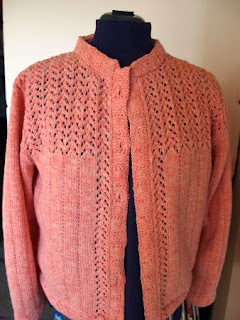 This is "Uma," pattern by Bonnie Marie Burns for Chic Knits. The yarn is Debbie Bliss's Cashmerino Aran, Merino, Microfibre and Cashmere. 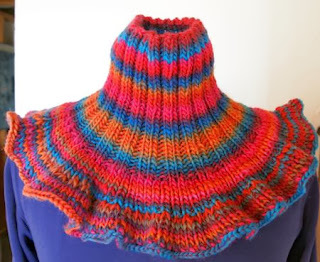 Yummy to knit with and once I figured out the unusual top-down construction, a fast knit! Linking up to Tami's Amis Work in Progress Wednesday. 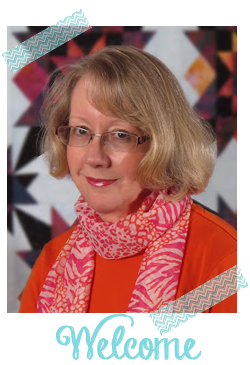 With the length of my Quilty To-Do list this month, I need to turn off the TV and get back to the sewing machine! Such pretty pieces! I like that sweater and the scarves are lovely. Thanks, Vic -- now if I could just find those buttons!